Do you know how to create an A+ resume that makes the grade? Educate yourself by taking cues from this sample resume for a teacher. Do you know how to create an A+ resume? 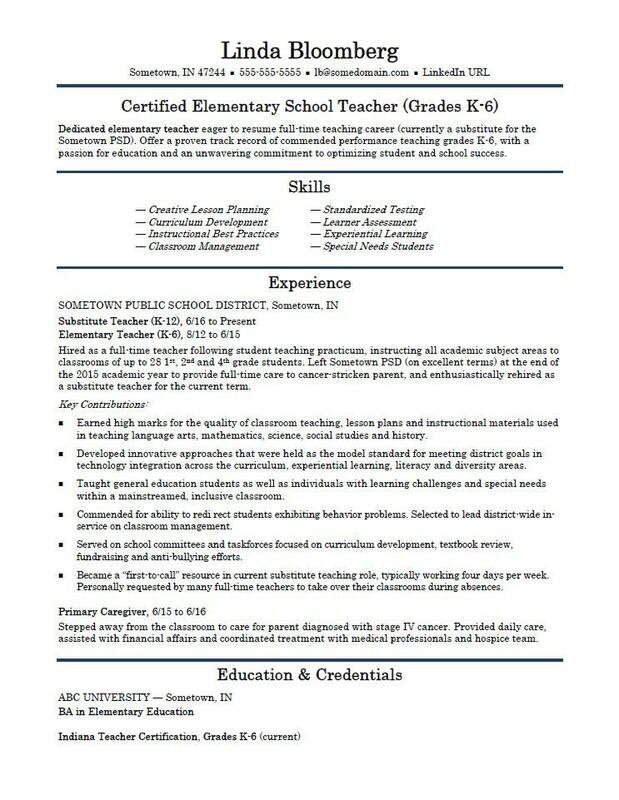 For guidance, view the sample resume below, and download the elementary school teacher resume template in Word. We also have sample resumes for a middle school teacher and a substitute teacher. Additionally, you can learn more about education careers on Monster. Dedicated elementary teacher eager to resume full-time teaching career (currently a substitute for the Sometown PSD). Offer a proven track record of commended performance teaching grades K-6, with a passion for education and an unwavering commitment to optimizing student and school success. Hired as a full-time teacher following student teaching practicum, instructing all academic subject areas to classrooms of up to 28 1st, 2nd and 4th grade students. Left Sometown PSD (on excellent terms) at the end of the 2015 academic year to provide full-time care to cancer-stricken parent, and enthusiastically rehired as a substitute teacher for the current term. Earned high marks for the quality of classroom teaching, lesson plans and instructional materials used in teaching language arts, mathematics, science, social studies and history. Developed innovative approaches that were held as the model standard for meeting district goals in technology integration across the curriculum, experiential learning, literacy and diversity areas. Taught general education students as well as individuals with learning challenges and special needs within a mainstreamed, inclusive classroom. Commended for ability to redirect students exhibiting behavior problems. Selected to lead district-wide in-service on classroom management. Served on school committees and taskforces focused on curriculum development, textbook review, fundraising and anti-bullying efforts. Became a “first-to-call” resource in current substitute teaching role, typically working four days per week. Personally requested by many full-time teachers to take over their classrooms during absences. Stepped away from the classroom to care for parent diagnosed with stage IV cancer. Provided daily care, assisted with financial affairs and coordinated treatment with medical professionals and hospice team. Does your resume make the grade? Learning the do's and don'ts of resume writing is an education in and of itself. Want to make sure you're hitting all the right marks? Get a free resume evaluation today from the experts at Monster's Resume Writing Service. You'll get detailed feedback in two business days, including a review of your resume's appearance and content, and a prediction of a recruiter's first impression. Don't think of it as a test, but more like some assistance from a private tutor.